We are in Africa as we send out this Spring Newsletter but wanted to send it out now as so much seems to be happening. May you be blessed as you read and pray that the work of the Lord’s Kingdom may continue to advance. The Lord has shown His mercy in so many ways. We look forward to sharing these testimonies starting next month. Click here to view the Spring 2019 Newsletter. This book will be launched in various locations throughout 2019 with a special lecture on the Bible School Movement. … updated Oct. 26, 2018 to fix link to Newsletter. Click here for the Fall 2018 Newsletter. It has been a busy summer and autumn thus far due to travels throughout North America (and also in the UK) to speak with many about the ongoing need for theological training (15 churches in total). Many congregations have been most welcoming and have affirmed their partnership in this very important ministry of the Word of God. One focus of discussion has been on the call for indigenous theological education and a call to co-labour with the global church. There have been a few good smiles concerning the analogy I have been using about raising children. Special thanks to Donnie Frizell for a good discussion about that! Also, thank you to all who have been so kind and welcoming. Along the way, there was also opportunity to speak at and participate in two conferences, and that was most stimulating. You will notice with this newsletter that we have retooled our Haddington House logo in an effort to update a little. Next year is our 25th year and we are busy thinking about that. 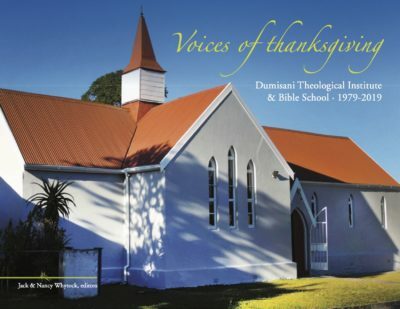 Our newsletter this autumn focuses on introducing the 2018 Journal, the book project which is being worked on right now – Voices of Thanksgiving, updates on projects at one of the overseas partners— Dumisani Theological Institute, and the fall teaching schedule (which is very limited this year as many of you will know) and an update about Nancy. I will not be teaching the master’s courses at Africa Reformation Theological Seminary, Kampala, Uganda this year but am planning to teach there in November, 2019. Thanks to Dr. Charles Jackson for taking my courses there this year at ARTS so that I can be home more with Nancy while she is not able to travel to Africa. Good things are happening at ARTS; it is so encouraging to see this seminary advancing the Kingdom by training many in the Word. The Summer & Autumn speaking schedule is filling-in quickly. The Director, Dr. Whytock, will be speaking at the following confirmed times below. Additions are being added as they are confirmed. Please contact Haddington House for more specific information as to exact locations. July 18 Charlottetown, PEI (7:00pm) @ Free Church of Scotland Birchwood St. This article by Dr. Jack Whytock explores the reformation of space for public Christian worship past and present. The article has three parts: 1st, a general survey of worship space at the eve of the Reformation; 2nd, the response of the Magisterial Reformers; and 3rd, the ongoing use of space for public worship, chiefly in the evangelical/reformed tradition.